Scott  describes Mayotte as "One of the Comoro Islands in the Mozambique Channel midway between Madagascar and Mozambique". The story begins similarly to Anjouan, Grand Comoro and Mohéli, but diverges in 1975. 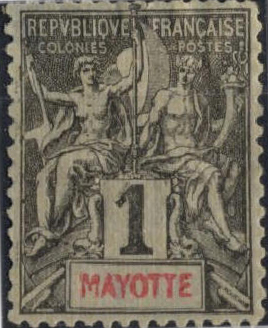 In 1891 Mayotte became a French colony; from 1914 until 1950 it came under the contol of, and used the stamps of Madagascar. From 1950 it used the general issue stamps of Comoro Islands and in 1975, while Anjouan joined with Grand Comoro and Mohéli to form the independent State of Comoro, Mayotte became an Overseas Department of France, using French stamps.